I own loads of rechargeable NiMH AA and AAA batteries, but most always seem to be dead when I need them. So, I wanted a cheap and fast way to make battery chargers that I can keep on my desk, so that I could have an armada of charged batteries at all times. I didn’t want to take up more outlets and have more wire spaghetti with plug-in chargers, so I settled on a solar charger. I’m in the solar business so I had stacks of small pieces of raw lasercut PV silicon cells (solettes) laying around, and I first made a simple battery charger with a few business cards as a backing. 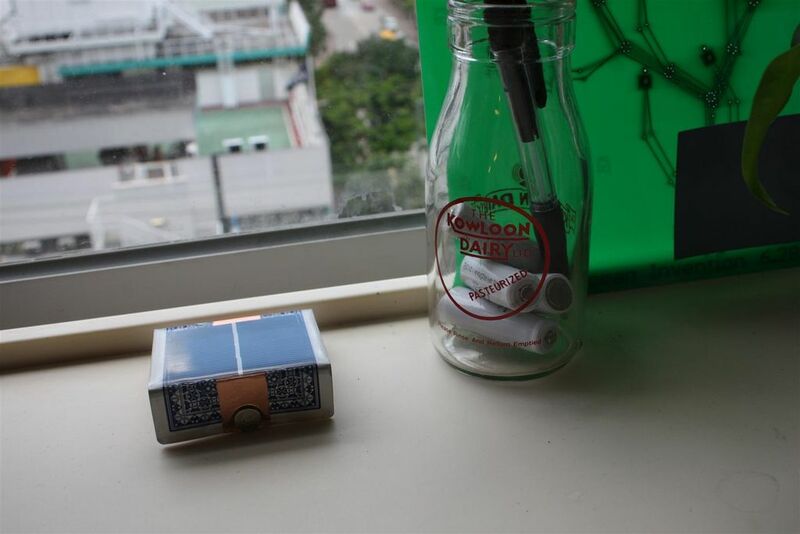 Then I found that playing cards were a more stable backing — and besides, they looked neat. 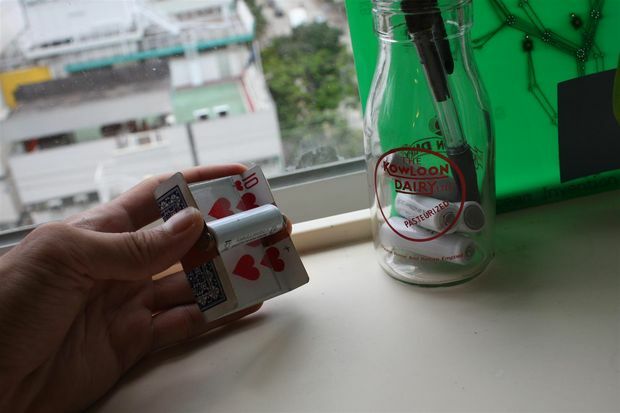 This instructable details my efforts to make a simple solar battery charger made out of a playing card, some solettes, some magnets and super glue — if anyone has ideas on how to make this simpler and more effective, please let me know in the comments. No soldering is required for this project. It should take about 10-15 minutes. So, to make this easier, my buddies and I are launching a Kickstarter campaign (Aug 15 – Sept 14) for all your solar DIY needs: http://www.kickstarter.com/projects/alex9000/the-solar-pocket-factory-an-invention-adventure Bangorang! 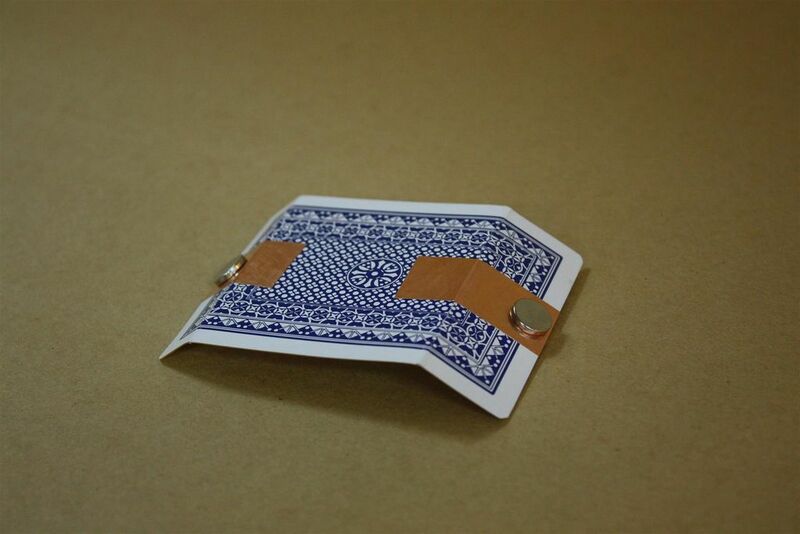 Bend the playing card so that you end up with two flaps that can touch the contacts of a AA battery. 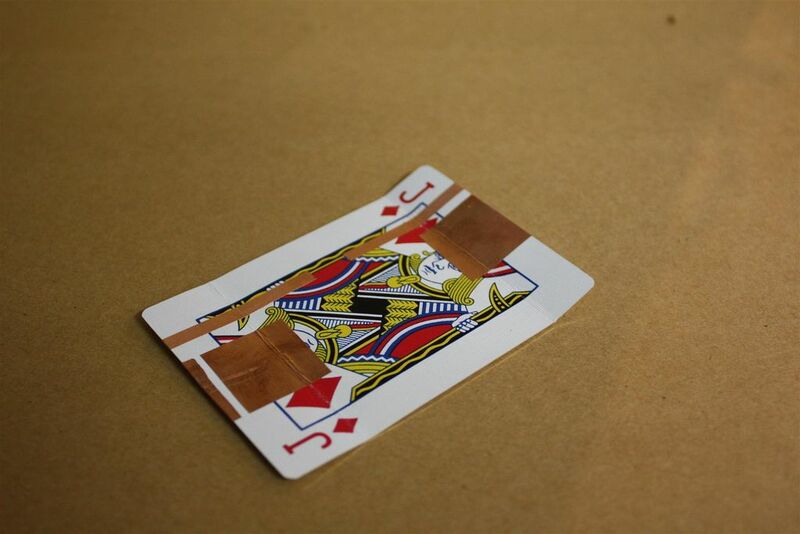 Then add a couple pieces of copper tape, taking care to wrap the copper around the entire width of each flap. These will be your wires that connect the output of a string of solar cells (the solettes) with your AA battery (via some magnets). I’ve also added an extra copper tape trace, for an indicator LED on the underside of the card, so that I know the charger is operating properly — but this is not essential for a functioning battery charger. The magnets are the terminals that will connect your SunJack charging card to a AA battery. A rechargeable AA battery has a ferrous shell, which means a magnet can stick to it. We can pass a small amount of electricity (enough to charge the battery) around the nickel-coating of the NdFeB magnets, which means that when the magnets grab onto a AA battery, current can flow through the copper tape, through/on the surface of the magnets, and then into the AA battery. 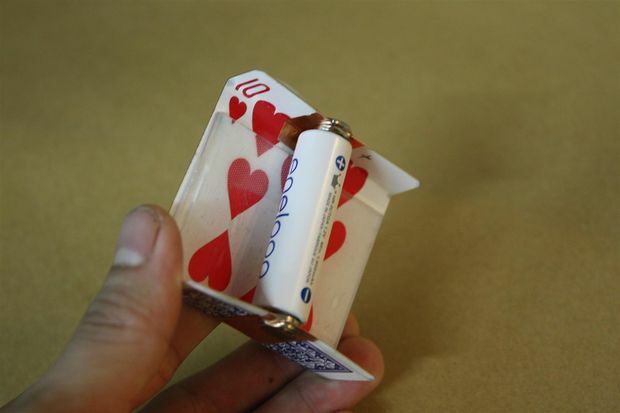 This same technique could be used to make a very simple playing card LED lamp, in which the battery is discharging into an LED instead of being charged. I used two magnets for each copper terminal of the SunJack, just to hold the magnets in place without adhesive. A single magnet on the underside of the card on each copper terminal could be used instead. This step is the key to getting the whole enchilada to work properly — combine solettes in series with a superglued shingling technique. 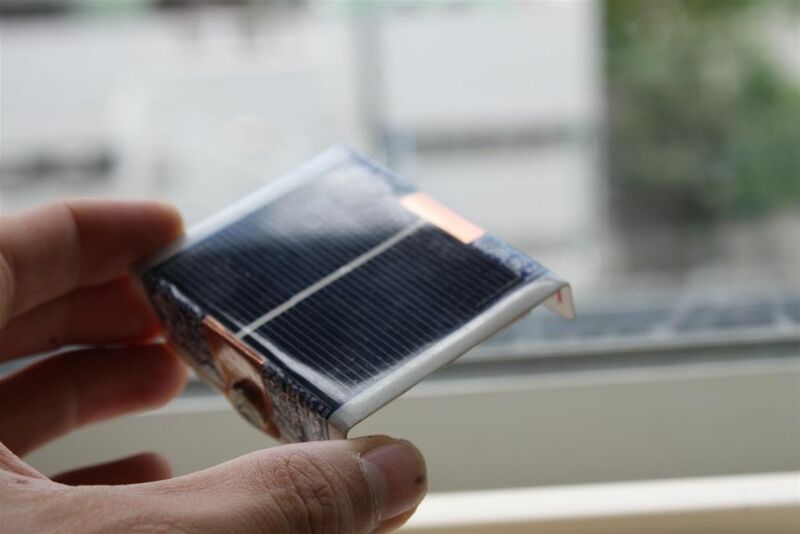 Each solette, or any chunk of mono or polycrystalline PV silicon for that matter, outputs around 0.5 – 0.6VDC, which is not enough voltage to do very many useful things. So, we need to combine enough of these solettes together in series so that their voltage outputs add up. In order to recharge a NiMH rechargeable battery, we will need a minimum of 3 solettes in series (or, 1.5V). The solettes we are using output Im (or, the max current at the maximum power point of the cells – about max power point here: http://en.wikipedia.org/wiki/Maximum_power_point_tracking) of around 100 mA per solette. So, since we are combining the solettes in series, the voltages add up, but the current does not. Or, to put it another way, 3 of our solettes in series will output 1.5VDC and 100mA. Truth be told, you could even safely use a much lower capacity battery if you are charging inside, near a window for instance. As long as your maximum current delivered is less than 1/20th the mAh capacity of your battery, all is well. Back to the solettes: The (+) output is the grey underbelly of the first solette in your shingled fan-stack. The (-) output of the series connected fan can ba accessed either at the bus bar or white silver ink runners on the blue top surface of the final solette in your stack, or by using a “false” solette that doesn’t produce electricity but just serves to bring do the top surface connections to a solette underbelly. Watch the video for more info. 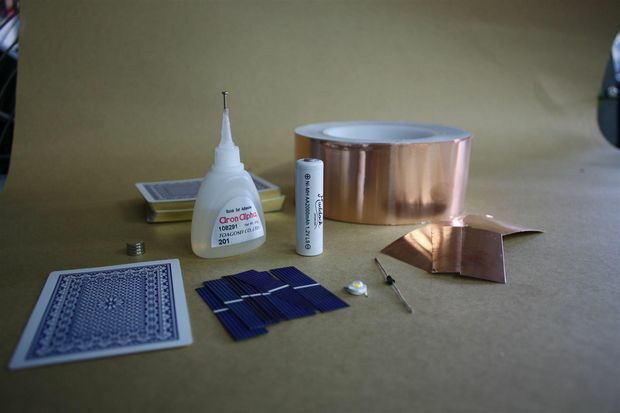 A few dabs of superglue (again, the very thin clear liquid stuff — also known as cyanoacrylate), a few seconds of pressure, and you’ve got yourself a solar series connection! Step 5: Encapsulate with 5-minute epoxy – and you’re done! Check the output of your SunJack at the inside/underside magnets — in noonday sun on a sunny day in, say, San Diego, you should read an open voltage of around 1.5VDC – 1.7VDC (if you used 3 solettes in series, or 4 solettes in series where one solette is just a dummy electricity carrier) and a closed current of, well, whatever the closed current of a single solette is. For solettes of the area I am using in this project, the closed current is around 175mA, whereas the max current deliverable to a load like a rechargeable battery is around 100mA. Now, mix up a bit of 5-minute, two part epoxy. Then, simply pour it onto the top of your SunJack card, over the solettes, magnets, and everything really — everything on the top side (the side with the solettes), that is. Take care not to get any epoxy on the inside magnets, since these need to freely carry current to your battery, and epoxy is highly insulating. I also like to add a rigid backing on the underside of the card, to stiffen the whole structure. Solettes are very fragile, and even an epoxy coat is not rigid enough to keep them from fracturing in many cases. I used a 1/8″ thick piece of scrap acrylic just in the middle section of the bent card in this particular model. One more note: It’s best to put your SunJack on some popsickle sticks or some other stand so that the epoxy can drip off the sides of the card. 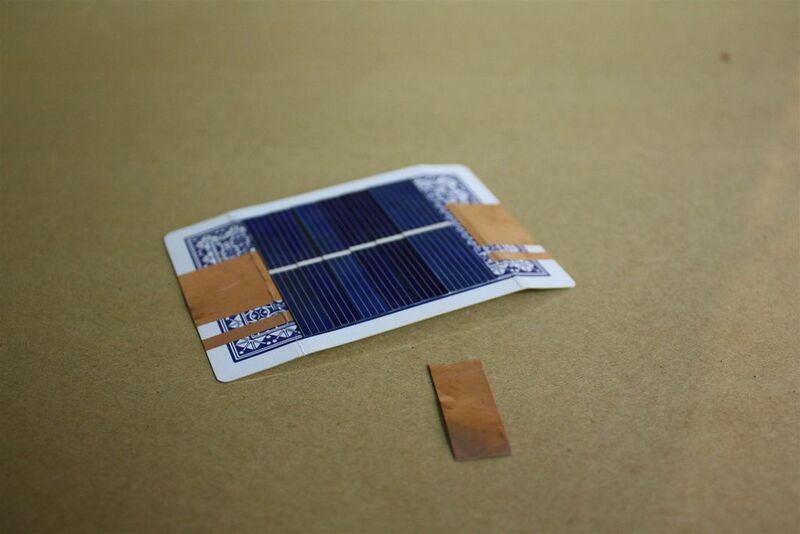 After 5 minutes of curing time, you have yourself a solar battery charger! Repeat 52 times and be popular. For more details and for dark-current protection diodes and charging indicator lights. These aren’t necessary if you are just charging your batteries during the day and have a multimeter to check that your system is working properly, but they are nice add-ons for the second or third SunJack you might make. Like this nice simple design. How many hours of full sunlight would it take to charge a battery?